Congregational Church, Maynard, MA 1852-2017. Click on photo to enlarge. The Union Congregational Church was Maynard’s first parish, established as a Evangelical Union Society in 1850, when eight locals decided to form a Sunday school. This predated the creation of the Town of Maynard by 21 years. Amory Maynard became the Sunday school’s first superintendent. The next step was to engage a preacher for Sunday services. Both school and services took place in the newly constructed train station. Prior to this, people walked or traveled by wagon the three miles to Stow’s Evangelical Church. 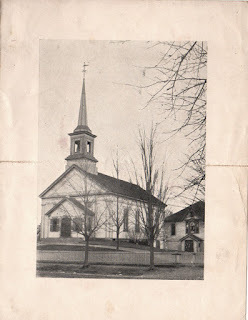 Within a few years these residents of Assabet Village incorporated as a church and selected a committee to find a site to build a house of worship. What came to pass is that Amory and his business partner William Knight donated land on Main Street (the same street they had petitioned Sudbury to build for access to their factory), and the building was built, financed by members. Buying in got these families reserved pews, as was a common practice of that era. The congregation dates it start to 1852, but did not move into the completed church building until spring of 1853. The cost of construction and furnishings came to $3,876. Rev George W. Frost was the first Pastor. Stained glass window in chapel of Congregational Church, Maynard, MA. Gift from Lorenzo Maynard in 1892, along with other windows. A sampling of important dates: The steeple acquired a bell in 1855; the church its first organ in 1959; the church was enlarged in 1866. In the early 1890s, Deacon Lorenzo Maynard (son of Amory Maynard) contributed funds for stained glass windows in the church. Four of the windows bear the names of his daughters – Frances, Mary, Victoria and Hattie – who predeceased him. He also donated toward the addition of the building on the west side, to house a chapel and classrooms, including a glorious stained glass portrait of Jesus holding a lamb, over the words “I AM THE GOOD SHEPHERD.” A similar window graces the Lorenzo Maynard family mausoleum in Mount Auburn Cemetery, Cambridge, where Lorenzo, his wife Lucy and their five children are interred. The building has no steeple from 1909 to 1920. The original had been blown off the building in a great storm on April 9, 1909. 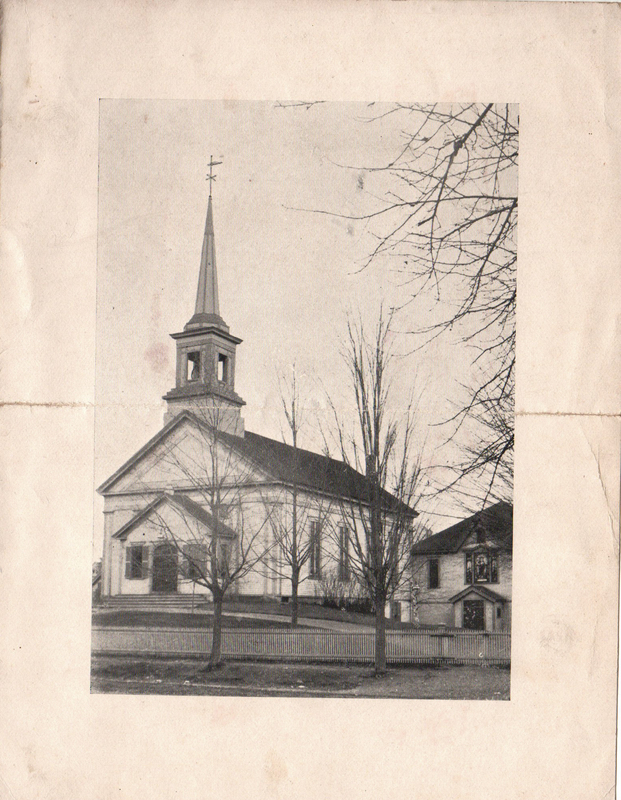 The church was officially renamed the Union Congregational Church in 1927. The bell was replaced by chimes in the mid-1940s. the sidewalk rather than the current stone wall. The closing of one church (Congregational 2017) or two (Methodist 2014) or three (Episcopalian 2006) is not unique to Maynard. Across the United States, what are referred to as the mainline Protestant churches have been undergoing a prolonged decline in attendance, membership and number of parishes since the 1960s. Estimates are that membership has dropped by half. In contrast, membership in Catholic and Evangelical Churches has been increasing, albeit not as fast as the population increase as a whole. The re-use of church buildings as such is problematic, characterized by problems with an aged infrastructure, and a question of what use the main nave and altar space can be put to. Two churches in Maynard were deconsecrated and converted to private residences. One in Acton became home to a theater group. The future of the historic Methodist and Congregational Churches in Maynard remains to be seen.